Perhaps the most difficult barrier to a Christian accepting the evidence for evolution and the age of the universe is Genesis 1. For many, rejecting the science is not a matter of lack of education or ignorance; it’s that they hold the Bible to be the inerrant Word of God. If I have a certain, divinely-delivered piece of evidence that says the Earth is young, then whatever scientific model I come up with has to take that evidence into account, doesn’t it? I believe in the inerrancy of the Bible, and yet I accept the theory of evolution. Perhaps in another post I will explain why I find the evidence in support of evolution so compelling, but in this post, I want to explain why I no longer feel that the Bible binds me to the young Earth model. This will not be an attempt to twist the words of Genesis and force them into the mold of current scientific understanding. Such attempts invariably do violence to the text, and never fit the science very well anyway. They are based on the assumption that, although Moses could have known nothing about modern science, God inserted scientific truth without his awareness. Could God have done this? Certainly. Moses tells us about events to which he was not a witness (the lives of Adam, Noah, etc.). This information could have been passed down by word of mouth, or perhaps God simply told him, but either way, we trust God to preserve truth in what Moses wrote. So God could have put scientific truth in Moses’s mind and pen. For that matter, he could have dropped scrolls from heaven in every language, past and future, but that’s not how God chose to communicate. Instead, he chose to express truth in the culture and literature of the time. God wrote the Bible in the words of real people, using their language, writing style, and literary genre. Although the main truths of the Bible are comprehensible in any language or time, studying the literature and culture of those times can help us avoid the assumptions of our own culture (which are easy to hold without even recognizing them as assumptions). When we look at the literature of the ancient Near East (Sumerian, Egyptian, Babylonian, Assyrian, Israelite), we see a generally consistent picture of what people thought the world looked like, which the picture to the right demonstrates (although the picture also includes some Israelite-specific concepts). 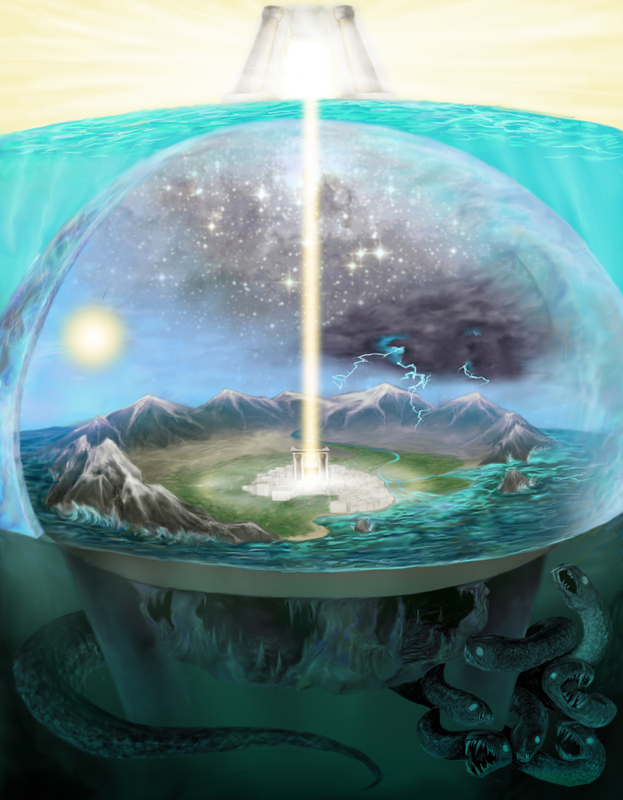 Moses, and everyone else of his time, thought the world was a single piece of land, surrounded by water to the sides and below; that the sky was a hard dome that included the sun, moon, and stars; that there was water above this dome that the dome generally kept out (which was where rain came from). They didn’t know that the sun was a star, or that the stars were much farther away than the moon, or that the moon was much farther away than the birds flying by. And God does not correct them. In fact, Genesis seems quite consistent with this view of the universe. Consider Genesis 1:6-8: “And God said, ‘Let there be an expanse between the waters to separate the water from water.’ So God made the expanse and separated the water under the expanse from the water above it. And it was so. And God called the expanse ‘sky’.” The word “expanse” has variably been translated “canopy” or “firmament”, but it refers to the dome of sky that keeps the water above us from coming down on top of us. In fact, from an ancient point of view, this second day is talking primarily about weather, since controlling the rain was the purpose of the sky-dome. God could have said, through Moses, that he created the atmosphere and the water cycle and the Coriolis effect, but he didn’t. He expressed himself according to the physical understanding of the time. Does this mean the Bible is false? Does it teach us that God created something–the hard dome of the sky–that in fact does not exist? Not at all. Remember, God was communicating in the context of this ancient culture. The Bible is not claiming that the world is physically built this way; it is making no scientific claims at all. Our obsession with material origins–how physical things made of atoms or photons got to be the way they are–is part of our scientific culture. It’s something we bring to the text, not something that is there already. For us, what is really important is how physical objects were made, but for the ancients, what was important was their purpose–the roles and functions and organization of the world. In day 2, God used an ancient physical model to communicate to his people that he created the weather, the cycles of rain and sun that ordered their world and were so important for the production of food. It was a function of the world, not the physical thing itself. With this is mind, let’s go back and look at the first day, the creation of light. As 21st century readers, we know that light is a thing. Even if we have no scientific background, we think of light as something that travels, that has a speed, that is made up of particles or waves. We know it can be used to power machines through solar energy. But Moses would not have thought of light as a physical entity. Light wasn’t a bundle of energy; it was a period of time. Light and darkness were simply times of day. Consider Genesis 3-5: “And God said, ‘Let there be light,’ and there was light. God saw that the light was good, and he separated the light from the darkness. God called the light ‘day,’ and he the darkness he called “night.” And there was evening, and there was morning–the first day.” We can see that God was speaking through an ancient concept of the world. Instead of describing the creation of photons, these verses are describing the creation the function of time, the cycles of day and night that ordered their world and lives. Throughout Genesis 1, we see God speaking not in terms of the creation of physical objects, but the separation of things to create order. The world is at first formless and without order. Then God separates the day from the night to establish the order of time. He separates the sky from the land to keep back the rain and establish the order of weather patterns. He separates the sea from the land to establish terrestrial order and allow food to grow. Yes, God is the physical creator of everything in the universe from nothing, and this is acknowledged throughout the Bible, but these passages do not tell us how or when that occurred. They don’t talk about physical origins. They tell instead about God bringing order and assigning functions to his creation . . . right up to the last day, when he gives humanity its function to fill the earth and have dominion over it, continuing God’s work of bringing order to creation. So, the Bible does not constrain our science. In fact, the pursuit of science to understand the world is one greatly in keeping with a Christian worldview, as I hope to demonstrate in a future post. We are free to study and understand the ancientness of stars, rocks, and body plans without conflict with God’s revelation, because God was not giving a scientific revelation in Genesis. He used Moses’s ancient language, culture, and physical model of the universe to communicate his role as the creator of all the order and function of the universe around us, and to give us our role under him, delegated as his image bearers to bring order out of chaos. Which brings us to the last significant theological hurdle we have to face to understand evolutionary science in the light of the Bible. What about the evolution of man? The ideas in this post are not my own. Most of them come from the works of John Walton, particularly The Lost World of Genesis 1, which I highly recommend. It goes into much greater detail (and gives more textual support) on the thoughts I’ve expressed, and explains many things I don’t have space to mention here. If God wrote the Bible to sound like ancient humans wrote it (‘in the words of real people, using their language, writing style, and literary genre’) … and if the sovereign Doctrine holds that God is in everything and is everywhere, including in the process of evolution … then why believe in God at all? You’re essentially saying that God has no discernible effect on reality, and that the inerrant Bible is indistinguishable from a faulty document written by ancient people. If belief in God has no effect whatsoever, and if belief in the Bible is equivalent to belief in a faulty document, then why go to the effort of praying and believing? This is a great question, probably worth a post of its own to answer. I don’t believe in God because his existence is made logically unavoidable by physical evidence. I believe because he’s told us about himself in the Bible. I wasn’t suggesting that the Bible is faulty. It sounds like ancient humans wrote it because ancient humans *did* write it, but they did so under the inspiration of God. They wrote what God wanted them to write, in their own style and genre. It’s not that the Bible tells us false things about science; it doesn’t tell us any science at all. Nature is sufficient to suggest the existence of a deity to have created it all in the first place, but it’s insufficient to tell us what God is like, why he made us, why the world is morally broken, and what can be done about it. For those things, we needed revelation. I don’t think the Bible is just one in a series of religious holy books; it stands apart as a true revelation from God. This isn’t something that can be proven scientifically. You have to read the Bible itself, consider its claims, and decide whether or not to believe it. I do believe that God has a profound effect on reality. Everything exists because God made it that way. Everything continues to operate because God maintains it. Nature is not deterministic; it is dependent on quantum probabilities, on random mutations, on all sorts of unpredictable factors. The fact that it is orderly and rule-based doesn’t mean that, if you could precisely define the state of every particle, you could predict every particle interaction, and thus roll the future out like a movie. The universe isn’t built that way. Just because I don’t believe God’s influence on the world is limited to gaps in scientific understanding, that doesn’t mean I think he has *no* influence. On the contrary, I believe everything that happens, whether predicted by science or not, happens under God’s direction and control. There are also those times when God interacts in a supernatural way, i.e. when he breaks natural laws to accomplish a special purpose. I think one should be very reluctant to claim something is supernatural; in most cases, what appears to be supernatural is just something natural that is not fully understood. (And it doesn’t need to be supernatural to have been caused by God.) However, I believe God does sometimes break natural laws, as can be seen in the miracles of the Bible, in the virgin birth, in the resurrection of Christ from the dead. Science can’t disprove these occurrences any more than it can disprove the existence of God. They are not repeatable through experimentation, and they are, by definition, outside of natural law. I’d have to whole-heartedly disagree. While there is some obfuscation of language in the initial versus, you’ve reinterpreted “let there be” to mean “it is the time for doing this thing”, however it makes no textual sense when looking at the entire passage (there’s no ambiguity that he is creating terrestrial and sea life), and I do not believe the Hebrew supports your assertions. However, I am not a Hebrew scholar, so can you provide someone who is that legitimizes your interpretation of the text? Yes I can. John Walton is a Professor of Old Testament at Wheaton College and an editor and writer of Old Testament comparative studies and commentaries. He has published dozens of books, but the one to read is The Lost World of Genesis One. There are many reviews of the book online, and there are some summaries and video interviews, but if you want the in-depth Hebrew analysis and word study, you’ll have to get the book. It’s quite readable for non-Hebrew-scholars, and not too thick. Excellent discussion, including the comments and responses. The main point made is that “God was communicating in the context of this ancient culture.” He didn’t bother to correct Moses’ cosmological viewpoint because that wasn’t important. The important thing then, as now, was our need for developing enough of an understanding of God to have a relationship with Him. We don’t insist our small children understand how cars and airplanes work, we just want them to learn to trust and love us.